This entry was posted in articles and tagged divorce, Domestic Violence Industry, IrBM, Irretrievable breakdown of marriage, marriage by admin. Bookmark the permalink. Wrangling over alimony and settlements has been a common phenomenon down the years but cut to 2012. Lawyers now find a new emerging trend in family courts. Instead of men paying alimony and divorce settlements, it’s the women who are now coming forward to pay settlements and compensation to their divorce reluctant husbands so that they can quickly get on with their lives. The women shell out money to get rid of the legal hassles of lengthy divorce procedures and to quickly move on with their lives. These women are working, independent and mostly aged in their late-20s and early 30s and place a premium on time. “To get a quick and easy divorce, women are coming forward to pay the legal charges, compensation and settlements to their husbands. They just don’t want to contest the case and drag the divorce procedure for years by letting the spouse appeal to higher courts. All they want is to begin life anew at the earliest and don’t mind denouncing permanent alimony,” pointed out family court advocate Anita Salabh Jain. 28-year-old V. Janaki (name changed), working in the telecommunication department, had filed a dowry harassment case against her husband, a government employee. “My husband got bail and said that he would contest the case and even move the Apex Court to take revenge on me for sending him to jail, as it had cost him his job. It would simply mean our divorce case might get dragged on for years while it was impossible for me to stay with a abusive husband. I withdrew the criminal case against him, decided to forego permanent alimony, gave him adequate compensation for his lost job, paid the security amount and all legal expenses, all of which amounted to a few lakhs of rupees,” she said, adding that after a few counseling sessions and all these compromises, her husband agreed to go in for a mutual divorce. The news story talks about a new trend, however it provides a grand total of one instance of Ms V Janaki cited as proof of the trend. More importantly, it does not give comments of Ms Janaki’s husband who was on the receiving end of dowry harassment case, which might have helped readers on getting the full picture. 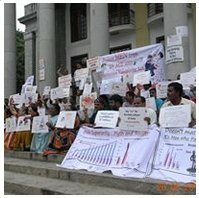 Here we attempt to give a more complete and realistic picture of what is happening in society when it comes to marital disputes, separation, and divorces, keeping Ms Janaki’s case as the backdrop. Ms Janaki decides she does not want to stay in marriage. She checks her options and realizes that getting a divorce in India is pretty much a impossible exercise unless both parties agree to a mutual consent divorce. At the same time, her lawyer/advisors (read gold-diggers) advice her of possibility of getting a quick divorce along with a lumpsum settlement should she decide to file on her husband what is commonly known as a dowry harassment case under section 498a of IPC (Indian Penal Code). Ms Janaki starts dreaming of hitting the jackpot and getting rid of her husband in one shot. Her advisors start dreaming of possible lucrative cash flow when the game is over and done with. She files a IPC 498a case on her husband. The police is all too eager to help since who can turn down a woman in distress, never mind that the conviction rate under IPC 498a is in single digits! Contrary to the expected plan, Ms Janaki’s husband is made of higher mettle and decides that there is no point trying to enter into financial settlement especially after losing his job. What more is there to lose anyway? He decides to fight the criminal case even if it takes him a few years. Ms Janaki realizes the game did not work out as planned, and wants to cut short her losses (time) and decides to pay to husband. Phew! NEW DELHI: Divorce, “illegitimate pregnancy” and professional/career problems seem to be pushing more people to commit suicide. According to the NCRB report, in 2011, at least 16 people committed suicide every hour and the total figure was 1.35 lakh. While family problems accounted for almost one-fourth of suicides, illness was another major reason. Interestingly, suicides due to divorce and “illegitimate pregnancy” saw a rise of 54% and 20% respectively in 2011. The report showed that 70% of victims were married and Rajasthan recorded maximum mass family suicides in the country. Statistics and trends compiled by the board showed that social and economic causes led most men to commit suicide whereas emotional and personal causes mainly drove women to take the extreme step. Underlying the economic angle to suicides, the report said 38% of victims were self-employed whereas the share of those with permanent jobs (government jobs) committing suicide was negligible at 1.2%. West Bengal, Maharashtra, Tamil Nadu, Andhra Pradesh and Karnataka accounted for 56.2% of the total suicides in the country while West Bengal recorded the highest number of suicide victims. Among 53 mega cities with over 10 lakh population, Chennai registered 2,438 suicides while Bangalore (1,717), Delhi (1,385) and Mumbai (1,162) followed. The four cities reported almost 36.7% of the total suicides. The report showed Nagaland reporting the highest increase of 175% in suicides in 2011 compared to the previous year while in Chandigarh, it increased by 47.9%. The data showed 72 mass/family suicides in Rajasthan and 19 in Kerala. Using poison and hanging were the two most common modes of committing suicide across the country.